For people unfamiliar with the last few versions of the Dungeons & Dragons roleplaying game (and for that matter its stepchild the Pathfinder Roleplaying Game), feats are special abilities players can select to customize and improve their heroes. The Dungeon! boardgame doesn’t have anything like feats in its core rules – but there’s no reason they can’t be added! While there could easily be dozens of feats in the game, I started with a fairly basic set of eight. Prior to play, each player may select one of more feats to add to his heroes abilities. Feats are entirely optional, even in a game using feats a player is not required to add feats. Each feat a character adds increases the amount of treasure that hero needs to escape with by 5,000 gp. Clerics and rogues may select a maximum of 2 feats, while fighters and wizards may select a maximum of 4. Only a cleric may take cleric spells. The cleric gets 1d6 spells. (You can use index cards to track a cleric’s spells). The cleric may choose any number of the following spells, up to the limit rolled. Like a wizard’s spells these can be used only once. Unlike a wizard, a cleric cannot replace spells by spending a round in the Great hall. Cure Wounds: When the cleric is seriously wounded or wounded as a result of a Monster Strikes Back roll, he may use this spell to instead only be stunned (drop 1 treasure card). Only a hero who has Toughness may take Die Hard. The hero beings with 1d6 Die Hard tokens (you can use anything to track these). When the hero suffers a Monster Strikes Back result, he may spend one Die Hard token to force the monster to reroll. The hero is stuck with the second result, even if it is worse. The hero does not lose a turn when a trap says to lose a turn. The hero may move up to 6 spaces, instead of the normal 5. Select one spell (fireball or lightning bolt if a wizard, divine might if a cleric with the Cleric Spells feat). When fighting a monster with this spell, add 1 to the die roll. The hero does not drop a treasure if stunned by a Monster Strikes Back roll. If the hero rolls doubles on a die roll to fight a monster, the hero may add +1 to the result. This does not apply to spells. Only a fighter may take Weapon Specialization, and the fighter must also have taken Weapon Focus. The fighter adds 1 to all die rolls to fight monsters. The playstyle and rules of the new Dungeon! boardgame are very, very close to the way the original ran when I played it back in the late 1970s. There are some name changes (elves are now rogues, heroes are now clerics, superheroes are now fighters), some new monsters, and some new management details, but in general the play experience is about the same. I’d say this was more a clean-up and updating than a revision, and that’s fine by me. I loved the original, and am enjoying the current version as a quick-and-easy diversion with friends. However, just because the new Dungeon! isn’t a major revision doesn’t mean you can’t take it farther. While playing the game this week, it struck me that all the elements for making it a cooperative game, where everyone works to win together, are already in place. With just a few extra rules, the existing boardgame can offer an entirely different style of play. Below are more initial rules for Cooperative Dungeon! 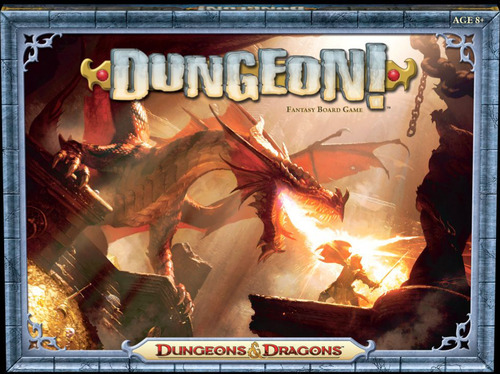 In Cooperative Dungeon!, either all the players win, or they all lose. To win, the players must “bank” treasure equal to the combined victory treasure values for all their heroes. (Thus a group of two dwarves and one wizard must bank 50,000 gp to win). The following rules are added to a Cooperative Dungeon! game. *A hero “banks” treasure by ending a turn in the Great Hall, and placing treasure in a “bank” cup. (Any space where you can keep the treasure that has been banked separate from treasure in play will do.) It doesn’t matter which treasure is banked by which player – all banked treasure counts towards the amount needed for the players to win. *Banked treasure can no longer be used by players. This makes the decision to bank items like the ESP medallion and magic swords tricky. *If a hero dies (gets a “12” on a roll of The Monster Strikes Back table), and unused heroes are available, the player begins a new hero in the Great Hall as normal. However, the amount of treasure the group needs to bank to win increases by the value of treasure the new hero would have needed to win in a normal game. *If a hero dies and there is not an unused hero available (all eight possible heroes have been used or are currently in play) the players lose the game. *When anyone gets a treasure card, they may decide to keep it or give it to another hero, as long as that hero is not in the Great Hall. This can be useful for moving treasure from lower levels to heroes closer to the Great Hall, or for moving useful treasures like magic swords to heroes who can best use them. A treasure can only be given to another hero when it is first obtained – afterwards it stays with whoever has it until it is banked. *Any cards that are revealed (such as those uncovered with the ESP medallion or crystal ball) are shown to all players and placed face-up. I have lots more rules expansion ideas – new heroes, new treasures, new monsters, even feats to customize heroes — and I hope to present those as time goes on, after I see how many people are interested in these. Players decide what their character looks like – just their bodily description – and nothing else. They are told the game is Pathfinder, and each given a blank character sheet. The setting is modern, but players do not known their character names, role, class, skills, or anything similar. Explain that their characters are similarly amnesiac – they know what society is like and who is president, but not the month, day, or their own histories. Each character awakes in a dirty room, with a pair of pants and a surgical gown. Have players describe their pants, but the gowns are all identical. Characters will obviously want their characters to get out of their rooms and do something. Doors are locked, the building they are in dingy and abandoned. As players try things (Knowledge checks to recognize thigns, Strength or Dex checks to force open doors or squeeze through tight spaces, and so on) have them roll d20s with no modifiers. Include some threat appropriate to the genre you want to run (see LOST, Persons of Interest, Phantom: Requiem for the Phantom, Cube, Cabin in the Woods, and similar fiction for an idea of what to use). Whenever a character misses a check, ask it the player would like a reroll. If the player does, tell them to increase the relevant ability/skill by 1. So a failed Str check reroll results in the character’s Str going from 10 to 11. Make sure to have a variety of kinds of things to do (an NPC in the same circumstance encourages social as well as physical efforts). If a characters rolls a natural 20 on a check, that also results in an ability/skill increase. When an ability/skill hits the highest level possible for the game level you want to run, stop giving reroll offers. (For ability scores you may want to keep track along with the player, so you know if they have hit the point-buy limit. Of simply things, and just let players hit a maximum of +8 total ability score bonus, with half their ability scores being odd and half even). For bonus points, give characters options of equipment from time to time, but limit what they can take. For example in each character’s starting room is a tool kit, a medical kit, a revolver, an automatic pistol, a crowbar, a pair of shoes, a riot shield, a utility knife, a laptop, a journal with a pen, and a make-up kit. Each is connected to a panel on the wall, out of reach of the others. When one is removed, the rest are hit by flamethrowers and destroyed. Whatever the character chooses, the character is proficient with. (Choosing shoes could be light armor proficiency – a desire to have protection, or the Run feat, or any of a number of options). As the first game progresses, periodically have players decide on things their characters remember. The character’s name, nationality, favorite meal, and so on. By the end of the first session, the characters find whoever or whatever brought them together, and overcome it. Then they get their memories back, and between the first and second game create their full characters, but must keep anything determined during the first session.